The Grenfell Action Group believe that the graphic above fully vindicates the concerns we have raised concerning senior RBKC Councillors relationships with, and acceptance of hospitality from, Peter Bingle and his Property PR company, Terrapin Communications, and clearly demonstrates that such concerns are well founded. The graphic reproduces an article from the well respected Ham and High newspaper dated 8th December 2016 highlighting concerns over the number of dinners that senior Haringey Councillors have enjoyed at the expense of Mr Bingle and his company. It not only names and shames leading Haringey councillors, but demonstrates their appalling judgement when dealing with lobbyists and developers. Following the damage done by the Parliamentary expenses scandal there’s a lingering public concern as to whether or not ordinary residents should view elected politicians as trustworthy. The Grenfell Action Group believe that it’s very foolish for councillors (whether they are from RBKC or Haringey) to act in ways which tend to confirm people’s doubts and suspicions, especially when it comes to public land and buildings and the awarding of contracts. 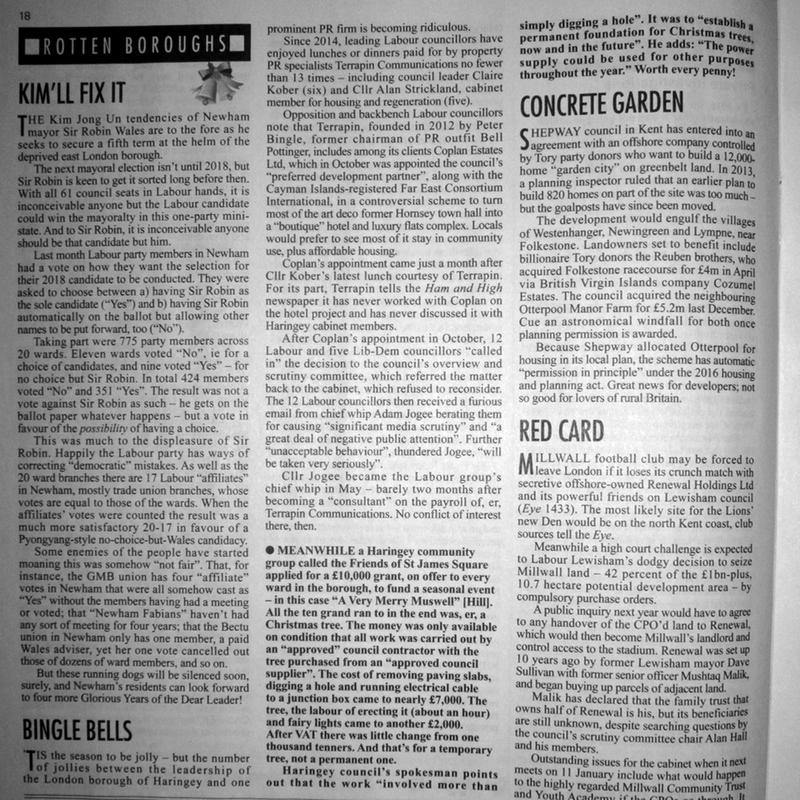 The article in the Ham and High was subsequently picked up by Private Eye and appeared, under the subtitle ‘Bingle Bells’, in the Rotten Boroughs section of that magazine in December 2016 (click on the graphic below to enlarge it). To be featured in this manner in the Rotten Boroughs column of Private Eye is widely regarded as a public censure and major embarrasment in British politics and should bring shame to all those mentioned. The Grenfell Action Group have now written to the Chief Clerk at RBKC, Nicholas Holgate, asking him to investigate what was discussed when Cllr Feilding-Mellen and Cllr Moylan dined at the expense of Bingle and Terrapin Communications and we have lodged a formal complaint that these meetings occurred without a council officer in attendance to witness and record any discussion of Council business or the Council’s sensitive property portfolio. The Grenfell Action Group have no idea what conversations took place between RBKC Councillors and Peter Bingle during these multiple lunch and dinner meetings and for all we know they could have spent their time discussing sport, or showbusiness, or the quality of the food or restaurant service. However this seems rather unlikely and one can’t help but wonder what else might have been discussed of concern to residents of the RBKC. Consequently, we think that it is entirely appropriate for us to list the current clients of Terrapin Communications and keep an eye on whether any of these, or other companies associated with Terrapin, are awarded lucrative contracts with RBKC in the future. This entry was posted in Uncategorized and tagged Cllr Feilding Mellen, Cllr Moylan, conflicts of interest, councillors wined and dined, Peter Bingle, RBKC Council, Terrapin Communications. Bookmark the permalink.